Do you own an expensive PC setup or a good console but couldn’t find an appropriate medium to play those games? Then you can either go for an ordinary $50 display or a dedicated gaming projector which would fully compliment your setup. So which would you reckon? We guess you must be going for the best gaming projector on the market. They serve as the best alternative to monitors and TVs, thanks to their 1ms response time, vibrant color, high contrast, impressive brightness, and wireless capability. It engulfs you with an immersive gaming experience which you won’t be able to experience because a projector can allow you to go beyond 100inch screen size. But do you know which gaming projector will be most appropriate for you? You must be puzzled as there are numerous models from different brands. To lift you out from the puzzle, we have created a list that carries the names of the top five finest gaming projectors from different brands. All these model carries different specifications, but they have one thing in common that they make sure you won’t find any lag while gaming. Now, it is time to cover the reviews of all these models, and we have put forward an unbiased review of all the models. At the end of the review section, we have also mentioned some answer to some queries that will arise in your mind when you go out to buy a projector. Optoma GT1080 is one of the highly regarded gaming projectors among gaming enthusiast that is designed in such a way that it can offer gaming monitor performance but in large size. It is an unconventional looking model that gets a decent set of attributes which you might not expect at this price point. •	Native 1920 X 1080 resolution. •	25000:1 contrast ratio with dynamic black. •	0.49:1 short throw ratio. •	Projection size: 45 to 300inches. Optoma GT1080 is a terrific device that comes as a dedicated gaming projector, and it efficiently lives up to its name. It is a DLP projection technology-based model that is configured with native 1080p resolution in such a way; it put forward a marvelous gaming visual with richness and detail. However the blend of 25000:1 contrast ratio and 2800 ANSI lumens make the main difference with its imperative vividness and black depth eventually making the gaming visual more lively. Sadly Optoma has restricted this model to Full HD resolution, but you can play games running at HD or something lower. The Brilliant Color technology in Optoma GT1080 serves as the central pillar behind its fluidic color output, and it causes the images to come alive with crisp whites and deep blacks. Do you drool to play 3D games on a large screen? This projector will fulfill your dream as it Full 3D compatibility including Full HD 3D playback at any screen size. It offers a 45.3-300inches screen size range so you ample amount of screen size choices. But it’s 0.49:1 short throw ratio takes all the limelight as it allows you to experience your game in 100inch size by keeping the projector from a few feet away. Like other gaming projectors, Optoma GT1080 doesn’t get a lamp with colossal longevity, and its 190-watt can only last up to 6500hours. Connecting different type of gaming device won’t be an issue as you will find HDMI, MHL, 3D-Sync, USB, and audio. Likewise carrying this model to your friend’s house won’t give you a headache because it only weighs 5.8lbs and it also comes with a carrying bag. You will even find a 10-watt speaker, but it won’t be useful if you required huge clarity and volume while playing your game. Optoma has offered a one year warranty with this model, but you will only get three months warranty for the lamp. Implausible 1080p and 3D quality. The color reproduction and clarity is quite good. It offers low input lag. It doesn’t require large space due to the short throw. The display shows rainbow artifacts. If you are living in a small apartment, but you dream to experience a considerable size gaming experience in your room, then Optoma GT1080 can be a plausible device for that dream. BenQ MW632ST is one of the most potent model in the gaming projector world that offers an intriguing list of attribute and fantastic performance but without pinching your budget. Many gamers love this model because it is economical and cradles all your basic gaming requirement. •	1280 X 800 native resolution with max UXGA. •	3200 ANSI Lumens with 13000:1 contrast ratio. •	0.9:1 short throw ratio. •	Projection image size: 30 to 300inches. •	Lamp longevity of 10000hours. •	Full HD 3D support. BenQ MW632ST’s main motto is to engage you in long gaming by treating you with eye-popping gaming visuals on a big screen. That being said, it uses DLP projection technology and 1280 X 800 native resolution to achieve its primary goal but that too without compromising on other functionalities. Even though it gets HD native resolution but still you will be able to play Full HD games with ease as it gets maximum UXGA resolution support. The 3200 ANSI lumens plays a crucial role in maintaining the richness and vividness in the visuals. It’s 13000:1 contrast ratio also help the frames to come alive with proper clarity. BenQ MW632ST is geared with 30 bits of display color and colorific technology so you can expect to get accurate color reproduction in all your gaming visuals. To make gaming session more interesting, it offers you native 16:10 aspect ratio along with five other options. You will even get to enjoy 3D games in Full HD without face any artifacts. Whether you are playing alone or with your friends, you can fiddle between 30 and 300inch screen size range. Even though it has a massive size range, but you won’t have to arrange an ample space for set up as it has a 0.9:1 short throw ratio. After purchasing BenQ MW632ST, you won’t have to think about lamp replacement for at least two years, and it is due to its 10000hours maximum lamp longevity. You can connect various type of devices for enjoying your game as it comes with HDMI, MHL, D-Sub, S-Video, composite, USB Type A & B, audio, RS232, and RCA. While starting your game if the image doesn’t fit properly in the screen, you can use the keystone adjustment, 1.2x zoom and manual focus for correction. It even bars you from purchasing headphone and speaker as it comes with a 10-watt inbuilt speaker although for decent quality we will suggest you to get external audio. Terrific visual output with optimum vividness. The clarity of the visuals is quite good. Low projection distance with wide screen size range. It supports full HD and Blu-Ray 3D format. It is low on weight. A massive number of interface options. It shows rainbow artifacts in videos. BenQ MW632ST is economical and perfectly suitable for gamers who are looking to treat themselves with a mesmerizing gaming session. Epson Home Cinema 2040 is a popular model in the gaming world that is loved by many gamers throughout the United States. It holds all the cards to cradle you with mesmerizing gaming session and that too without breaking your bank. It might look simple from outside but has the prowess to overthrow any affordable 4K projector in performance. •	1920 X 1080 native resolution. •	16:9 native aspect ratio. •	2200 lumens of brightness. •	7500 hours of lamp longevity. Epson Home Cinema 2040 is well packed full HD projector that has made many gamers go crazy over the gaming visual output. Epson has included its well known 3-chip 3LCD projection technology and Poly-silicon TFT active matrix which ensures you get what you paid for. But its native 1080p resolution along with 2200 lumens serves as the principal protagonist to bring out the eye-popping visual quality. It engulfs every dark frame in a game with heavy detailing, and for that, it gets assistance from 35000:1 contrast ratio. An interesting fact of this HD LCD projector is that it won’t ruin your gaming session with rainbow effects. Epson always emphasizes on the crispness in the gaming visuals, and that is why they have included frame interpolation and Image enhancement in Home Cinema 2040. Top notch color output is vital to bring out the best out of a gaming visual, so it houses a Full 10bits color processing with a 1.07billion color display. You can stay assured you won’t find any lag or motion blur issue while gaming because it gets low input lag with fast response time. Whether you want to play any particular game in 3D or watch 3D movies, you will get assistance from full 3D compatibility with maximum support up to 1080p at 60Hz. Epson Home Cinema 2040 simply takes the driving seat when it comes to screen size range, and it ranges from 34inches to 332inches. On the top of that, it gets an impressive throw ratio range starting from 1.22:1 and ends at 1.47:1. However, it fails in the inbuilt sound output because its 5-watt mono speaker falls short when it comes to delivering detailed sound quality. Interestingly the fan noise level is quite low, and it stays between the range of 29 to 37db depending upon the usage hour. Like every well-known gaming projector, it also features a decent lamp hour which resonates to 7500hours in ECO mode. You will find a lot of input option on the body of Epson Home Cinema 2040, and it comprises the likes of two HDMI, 2 RCA, USB Type-A and composite video. You can even use Roku streaming, Chromecast, Amazon Stick, etc. with this model as it also gets MHL support. To get you the ideal visual representation, Epson has supplied some tuning options like +/- 30-degree vertical and horizontal keystone correction, optical zoom and focusing. Unlike other best digital projectors, it provides you with a two-year limited warranty and 90 days lamp warranty. 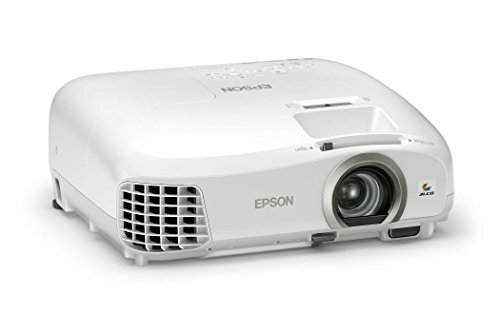 If you are seeking for a highly efficient gaming projector at an affordable cost, then hunt down the Epson Home Cinema 2040. Most importantly, it is incredible value for money that offers all the facilities. 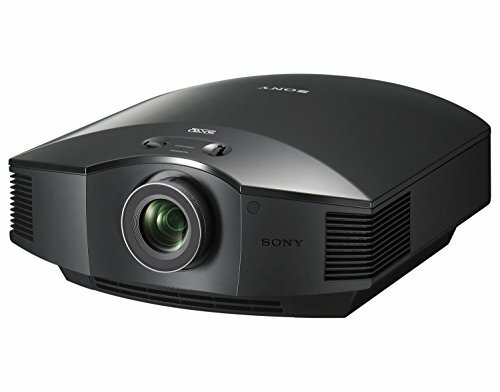 When you talk about best gaming projectors, one model that is prevalent in every top-tier list is Sony VPLHW45ES. It is a legendary projector that offers you one of the most excellent picture quality which can be compared with the quality of any ordinary 4K home projector. It holds an expensive price tag, but its performance and features make it worth that price tag. •	Full HD 3D compatibility. •	6000 hours of lamp longevity. •	Projection size: 40inches to 300inches. •	Three years limited warranty. Sony is always known for their prolific picture quality and impeccable performance in their projector. Likewise, VPLHW45ES also carries the same trait and its main motto is to cradle you with lifelike gaming visuals. To ooze out extraordinary visual quality, it utilizes SXRD projection technology which doesn’t require any introduction. It is based on 1920 X 1080 pixel native resolution and 1800 lumens which drives the vividness and clarity in the video frames. The black depth offered by this model deserves all the praise, and it is mainly due to it’s 120000:1 contrast ratio. However, it only comes with a single aspect ratio option which is 16:9. Sony has never compromised on the color output in their projectors, and that is why VPLHW45ES offers one of the best color accuracies in the gaming projector segment. The smoothness in the gaming visuals is quite impressive, and all the credit goes to its low input lag along with high response time. Not only that, to enhances the silkiness in the visuals it also gets assistance from Reality Creation and Motionflow technology which make sure you get to see every detail. It is a complete gaming package because it also offers Full HD 3D capability which will fulfill your dream to immerse yourself in the world of 3D gaming. The screen size range offered by Sony VPLHW45ES will merely leave your flabbergasted as you can change the size from 40inches to 300inches with ease. What’s more? You can toggle between the screen size without worrying about throw distance, and all the credit goes to its 1.36:1 throw ratio. You won’t be disappointed with its lamp life as it lasts up to 6000hours, but the replacement cost of the lamp is slightly costly. To allow hassle-free installation, Sony has installed the fan exhaust in the front position which offers maximum throw distance. With this model, you will also get the well-known whisper quiet fan which makes a sound around 22dB. Sony VPLHW45ES always looks after the convenience of their customers, and that is why you will 1.6x zoom ratio, lens shift, and various calibration options. Not only that it also features many input options HDMI, RS232C, RJ-45, USB, Audio 3.5mm and 12V trigger. With the USB you can quickly update the firmware and stay up to date with the latest features. The manufacturer has incorporated a three-year warranty with this model which is a boon to all the buyers. Sony VPLHW45ES can correctly seat with your requirement if your main priority true to life gaming visual output and nothing else. 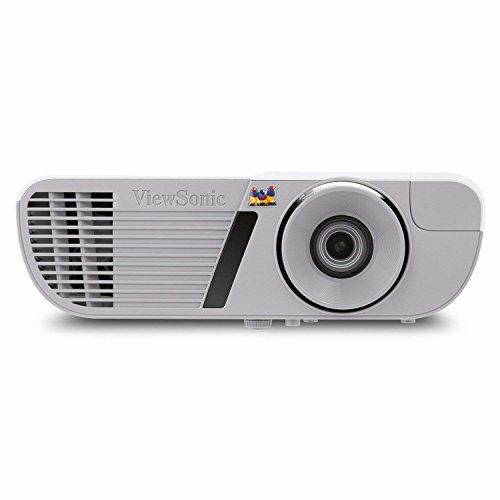 ViewSonic PJD7828HDL is an unconventional home cinema projector that cost like a projector 720p model but performs better than any ordinary 1080p models. It is one of the best gaming projectors on the market that is appreciated by a lot of buyers and experts. Not only it has won some esteemed awards for its incredible visual performance and functionalities. •	Projection size: 30inches to 300inches. ViewSonic PJD7828HDL is one of the highly reviewed gaming projectors that has hardly dissatisfied any of its buyers. It puts up a top of the line visual quality, and it is due to the amalgamation of 1920 X 1080 native resolution and 3200 lumens. Besides, it also houses Dark Chip3 DLP technology which serves as the primary pillar behind its eye-popping visual quality. But surprisingly it only bags 16:9 aspect ratio which could be an issue if you are serious about the screen aspect. The richness in the dark frames is impressive and 22000:1 aspect ratio serves as the main protagonist. The color reproduction ViewSonic PJD7828HDL bring out in the gaming scenes is breathtaking, and it takes assistance from SuperColor technology that provides large color gamut. It also gets SuperColor IPSMatch facility which blends color wheel coating, chromatic adjustment, and premium optics material to bring out lifelike color quality. Like every high-performance gaming projector, it also bags short input lag and fast response time around 16ms which bring out the lucidity in the frames. It also doesn’t even rob you from Full HD 3D, and you can play 3D contents from almost any source. Whether you want to play your game alone or with friends, you will always get to choose the screen size between 30inches and 300inches. Even though it offers you a mammoth display size but still ViewSonic PJD7828HDL has managed to keep the throw ratio around 1.15-1.5:1. The lamp longevity of this model is entirely praiseworthy, and it offers one of the best lamp life which is 10000hours. The fan noise is also low, and it stays between the range of 30dB and 35dB. It also excels well in portability segment, and you won’t find much difficulty carry it as it only weighs 5.3lbs. You can hook various external devices with ViewSonic PJD7828HDL as it bags some decent amount of ports comprises HDMI (3D Blu-Ray ready), 3.5mm Audio, RS-232, MHL, D-Sub 15pin, Wireless HDMI, and USB. Likewise, you will also get some pretty good tuning features, and they are +/- 40-degree vertical keystone correction, manual focusing, 1.3x zoom, etc. Interestingly it also houses two 10-watt speaker which is adequate for casual gaming. Lastly, you won’t have to worry about damage for three years because it gets 3-years warranty and 1-year lamp warranty. ViewSonic PJD7828HDL is a marvelous product that is suitable for buyers who are looking for breathtaking visuals in a gaming session. Once you get this model, you won’t regret your decision of buying it. Now, it is time to jump to the answers of frequently asked questions, and we are sure the following solutions will give you a bright idea about the projector. 1. How are pico-projectors built? How do I build one? Pico projectors are built in the same manner as an ordinary projector, but here all the parts except the lens are quite minute. The boards used are similar to mobile motherboards. If you have the right parts, you can quickly make one. You just need a 2inch screen, a small projector box, slide lens, small stock cooler fan, Fresnel lens, LEDs, a small switch, power connector and cables. At first, you have to take the LCD from the player and attach it to the projector box. Then you have to connect the LED to a heat sink, and after that, you will have to wire down the LED driver. After this, you will hook the lens and slide projector with the LED. You should arrange them in a line so that everything is in position. 2. 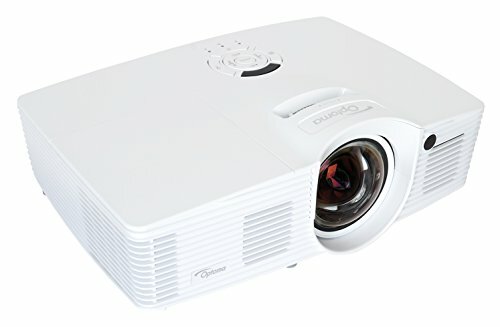 Are there any 1080p LED projectors? A few years ago the number of 1080p LED projectors were less but technology has evolved, and now you will find a lot of 1920 X 1080 LED models in the market. However, all the top models belong to ViewSonic and Panasonic and all of them priced above $1000. But apart from them, many other small companies are also providing 1080p LED models and that too at a rate below $500. 3. 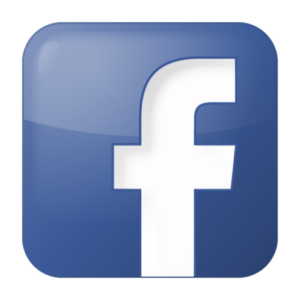 What is Digital Projection? 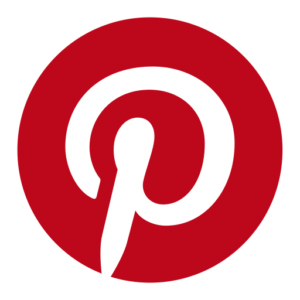 Digital projection is a method of projecting any content as an enlarged image on a screen from an external source. Basically, it connects PC, laptop, gaming console or any other player and projects the video content on the screen with the help of the projector. Digital projection takes assistance from a lot of factors before projecting an image like lumens, contrast ratio, color processor, native resolution and finally projection system. During digital projection, the projector takes help from the lamp to create the light output on the screen. The digital projection is a complicated process as a lot of factors comes into action. 4. Is it possible to turn a normal projector to a short throw one, with a lens? It is entirely possible to turn an ordinary projector into a short throw model with just one lens and tele-compressor to minimize the distortion. You can do it by mounting a wide angle lens or any lens with ultra short throw capability, and it will shorten the projection by half of the original measurement. You should make sure the glass should be wider in diameter than the existing and only then you will be able to convert a normal one to short throw model. 5. What is the difference between an LCD projector and a LED projector? 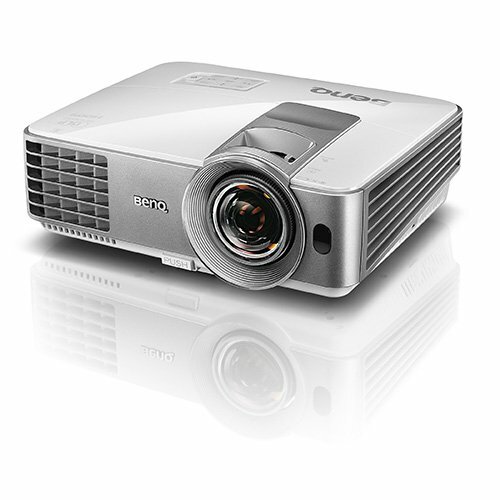 The main difference between an LCD projector and a LED projector lies in the light source utilized. LCD projection oozes light onto a mirror, and it then divides into three primary color which then passes through three separate panels. In the end, it again converges after passing through another prism and then falls on the screen which results in a sharp, bright and colorful image. Whereas LED projector uses either DLP or LCD technology for projection system and uses an LED lamp for the light source. LED headlamps have tremendous longevity, and they require zero maintenance. Not only that, the fans are quiet and come with an affordable price tag and much more energy efficient than LCD projectors.